Being born and raised in South Africa, I grew up in a very outdoor minded and sport focused culture. I started playing organized sports at the age of 5. During my school years I participated in rugby, cricket, track & field, swimming, tennis, field hockey, cross country, badminton, golf, and once I moved to the USA I played football. Rugby was always the sport I was most passionate about and I was able to play for Arizona State University while earning my degree. I have a tendency to be an introvert, but athletics was always an area I felt comfortable coming out of my shell. Sport has always been the outlet for my very competitive inner self. After graduating from college I moved to Idaho from Arizona, started my career in construction management, married my beautiful wife, and started my family. I assumed my days of competitive and team sports were over, so I resigned to the typical gym workouts thinking I would have no problem staying in the athletic shape I had been in my whole life. Wrong. I quickly grew bored of my solo globo workouts and found it increasingly difficult to motivate myself to workout. As a result, I didn’t, and my fitness went downhill. I was coaching high school rugby and could tell how my body was suffering when I would participate in drills or show players examples of what I wanted them to do. About this time Catie and Ben, my cousins, moved to town to open a CrossFit Box. It was Memorial Weekend 2014. The rugby season had just ended and Catie offered up a free workout at a local park for anyone I wanted to invite. I had been pretty skeptical of CrossFit but decided to give it a go, mostly to support Ben and Catie, and as an excuse to get my players another workout. A handful of my rugby players and their parents showed up for a “Modified Murph”. This was the day I realized just how out of shape I had gotten, I was completely humbled but also inspired by how the CrossFit community was honoring a fallen hero. Although I was barely made it through the workout I LOVED IT. So began my CrossFit journey, from the park WODS, to the garage, to our current amazingly outfitted box. CrossFit has given me back a competitive outlet, the team camaraderie I had been missing, accountability to show up, and functional fitness like I have never had before. Knowing what CrossFit has done for me inspired me to want to help others experience and enjoy all the benefits functional fitness provides. I developed a love for coaching with my rugby teams and thought what better way to combine the two than becoming a CrossFit coach. 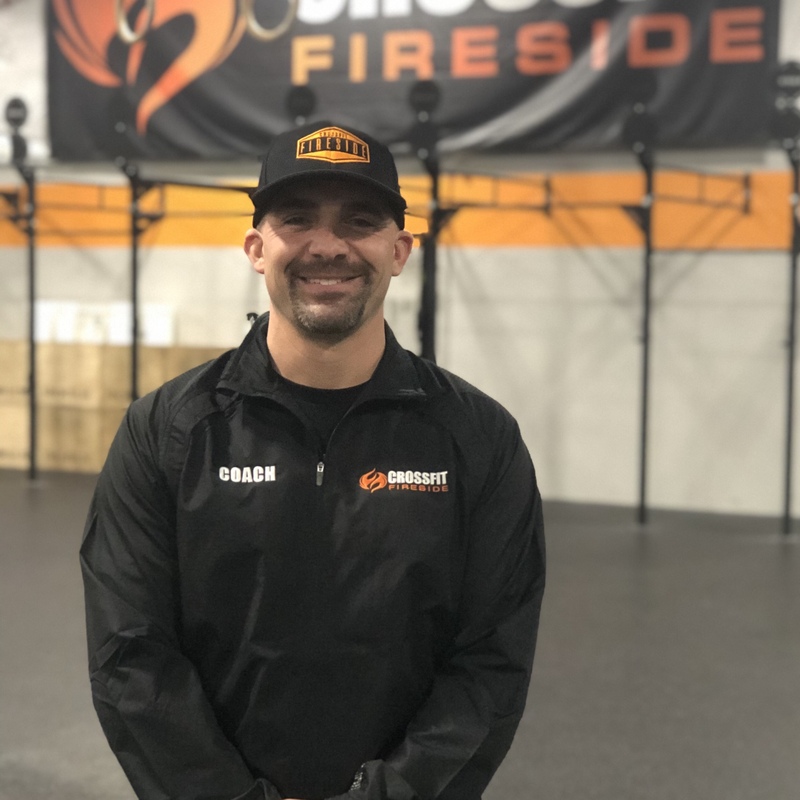 Being coached for 2 ½ years by two of the best coaches in the valley, earning my CF L1 Trainer Certificate, and working through Fireside’s intense internship program has expanded my knowledge and ability to help our athlete’s achieve and exceed their goals. We have a community like no other here at Fireside, one I am proud to be a part of.